I first saw the Le Brothers’s large-scale three-channel video projection installation Into the Sea (2011) at the 2013 Singapore Biennale. The video featured the identical male twins in a series of beautifully filmed scenes set against the languid backdrop of the ocean. On one screen, the long-haired shirtless pair dig into the sand on a beach, and one buries the other in the sand. The scene then cuts to them sitting, facing the sea in a pose of meditation. 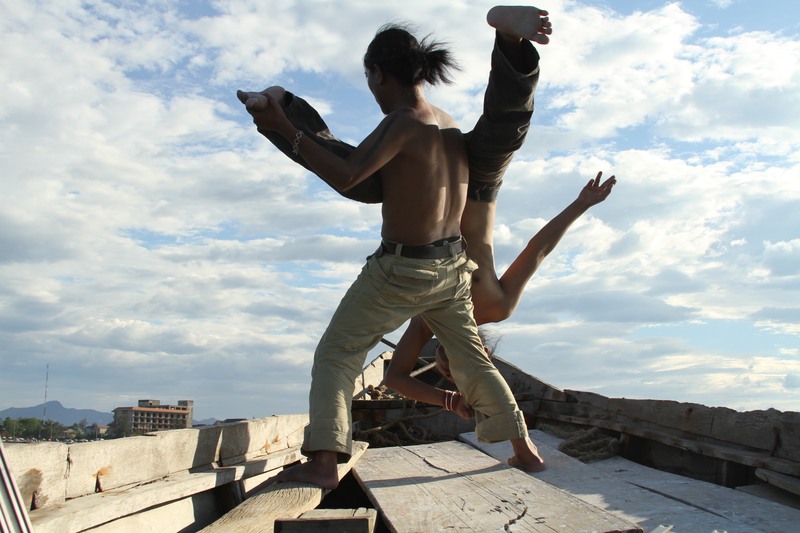 In the center video channel, they take turns to climb, and carry each other’s body with effort and care, on the open bow of a boat, against an expanse of blue water and sky; while in the final screen, also on the same boat, one brother sits cross-legged while the other winds colored yarn around his hair and body. These actions are performed slowly, accompanied by a mournful soundtrack; all three sequences conclude with one twin tying the other ritualistically with lengths of vivid red cloth.